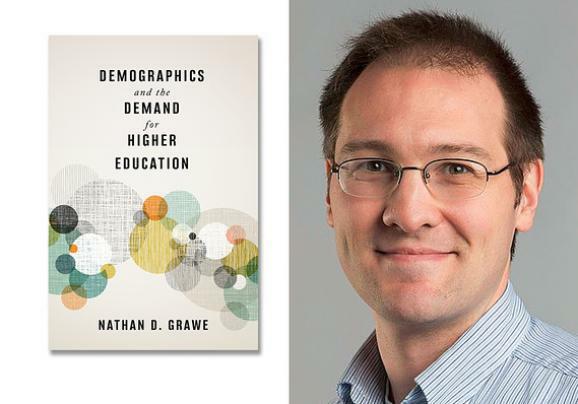 Nathan Grawe, author of "Demographics and the Demand for Higher Education." Nicholas first heard about Grawe’s book at the Association for Institutional Research national conference last summer. He then attended a presentation by the author at the association’s Midwest regional conference last fall. The faculty/staff forum featuring Grawe will be held from 1:30-2:30 p.m. Wednesday, March 20, in Reynolds Recital Hall. The remainder of his itinerary that day includes a breakfast discussion with community leaders, a meeting with the Senior Enrollment Management team, lunch with deans and department heads, a presentation and workshop with the Presidents Council and Strategic Planning and Budgeting Advisory Committee, and a meeting with Institutional Research staff.